When people think of Thestreet.com, they normally think of Jim Cramer. And why not? Jim Cramer is larger than life and is easily the most recognizable name at Thestreet.com. People either love Jim Cramer or hate him - there is really no middle ground when it comes to Cramer. 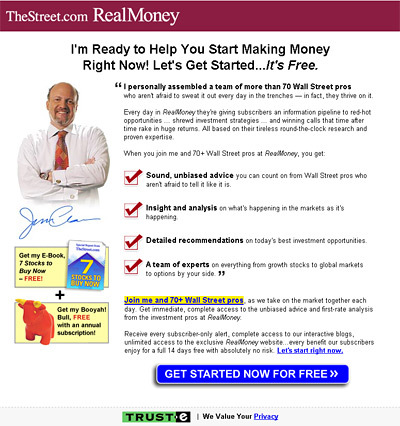 It's unfortunate, because the people who hate Jim Cramer aren't very likely to sign up for Thestreet.com RealMoney. This is unfortunate because there are 70 other really strong writers there that can help you to become a better trader/investor. One of my favorite financial commentators, Doug Kass, is a frequent contributor to Thestreet.com RealMoney. So what is the premise of the site? It's basically 70 different traders and financial commentators sharing their thoughts on the markets in blog format. There are stock recommendations. There is analysis of the current state of the markets from 70 different viewpoints. Some of the articles won't help you, but some you will find immeasurably useful. Some commentators you will ignore, while some will soon become an indispensable part of your daily routine. There is something for everybody on this site, and you are bound to find one or more writers that contribute greatly to your investment arsenal. Thestreet.com offers a free two week trial of this service. If you aren't liking the service, simply cancel before the free two week trial period is up and you won't be billed a penny. Given the amount of quality information that is on RealMoney, you really can't go wrong in signing up for a membership. At the very least, take the service out on a two week test drive. If you aren't liking it, simply cancel before the two week trial period is over and you won't be billed.